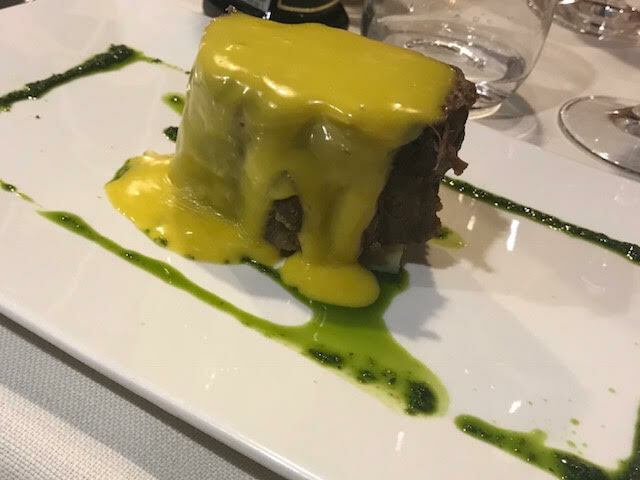 There is a little town in Tuscany called Querceto, and within this quaint, quiet place you will find the sophisticated La Locanda Del Sole(a Luciano Zazzeri restaurant). 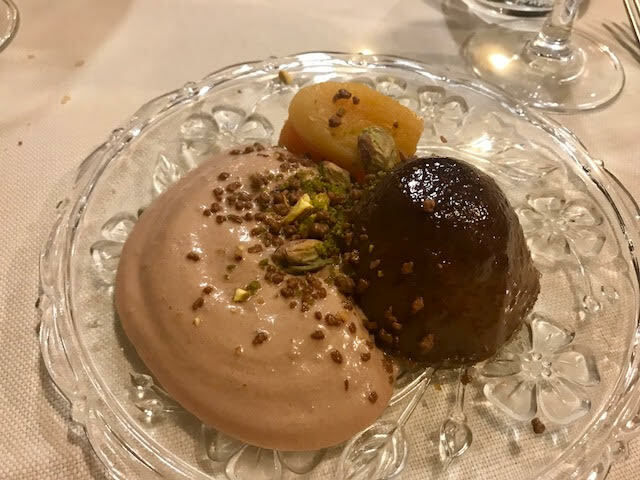 Open for lunch and for dinner, homemade pasta, wild game animals like boar(cinghiale), woodpigeon(colombaccio) and hare(lepre) are some of the ingredients found on the menu, and the dessert selection is absolutely wonderful as well. 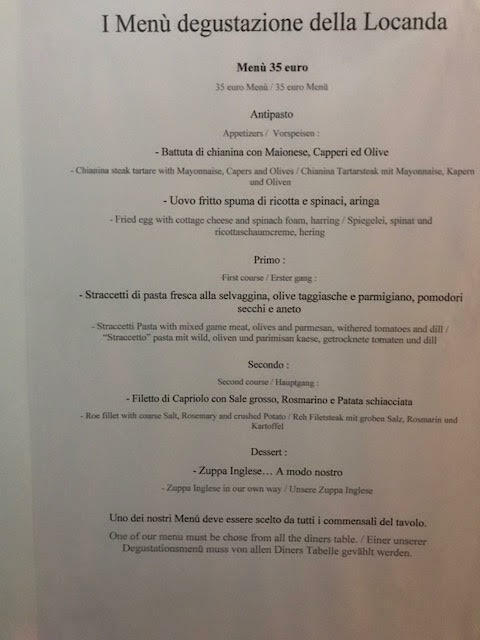 Additionally, there are two set menus which you can choose from(see pictures below). 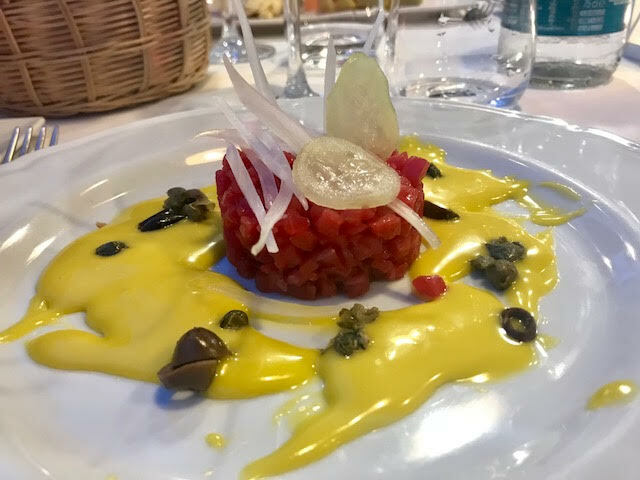 Chefs Enrico Menna and Edoardo Menna truly create the Tuscan dining experience. 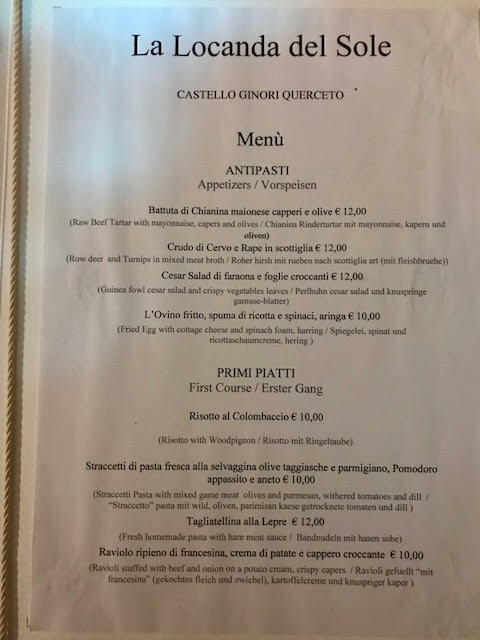 We had the pleasure of eating here twice during our stay at Castello Ginori, and both times were excellent. Both dinners consisted of different dishes as we had to try several things(everything sounded so good!). And both nights were equally as special. 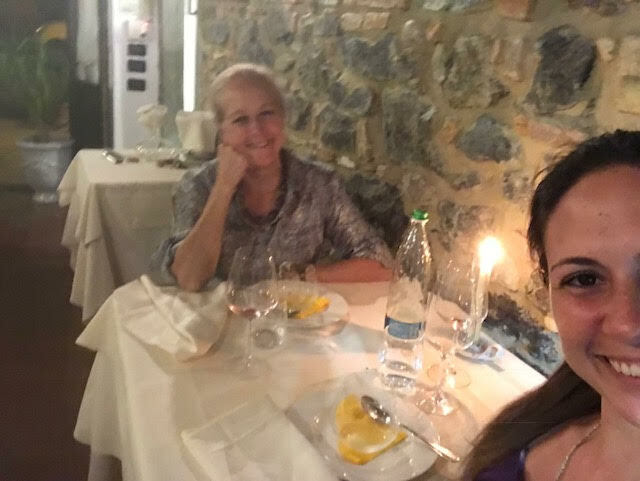 The service Lelo provided us was attentive and elegant, which was very much appreciated and made dining amidst a beautiful castle complete. 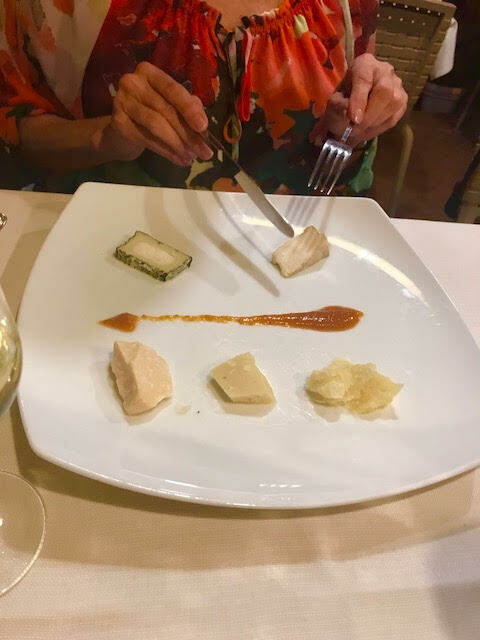 Gracie per tutto, Lelo! 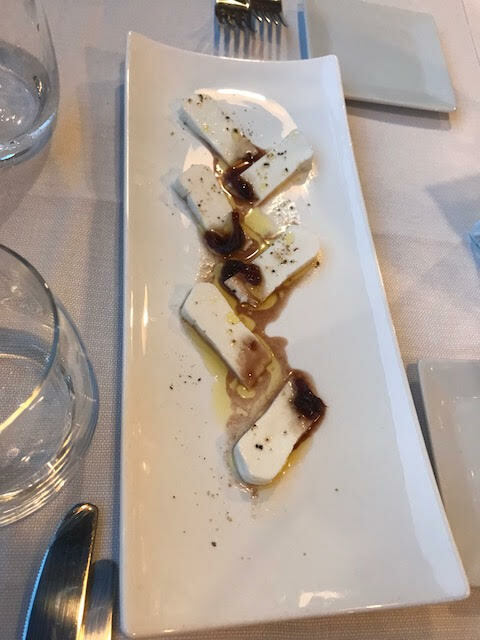 I would love to write the longest post about how delicious everything we ate was, but I’l break down into a short and sweet(and savory) description: The quality of the ingredients they use here are TOP, therefor, every plate combines with its accompaniment perfectly. Where it should be salty, it is salty, where it should be sweet, it is sweet. 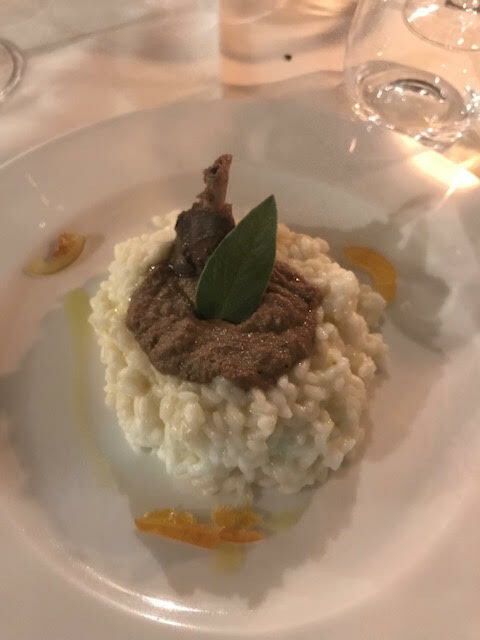 The textures and richness of the cheeses, the boar, the pasta, the risotto, the woodpigeon(all things I tried) were exactly how one should experience them. No flavor was overpowered by another flavor. No dish was overdone. Everything, was, perfect. 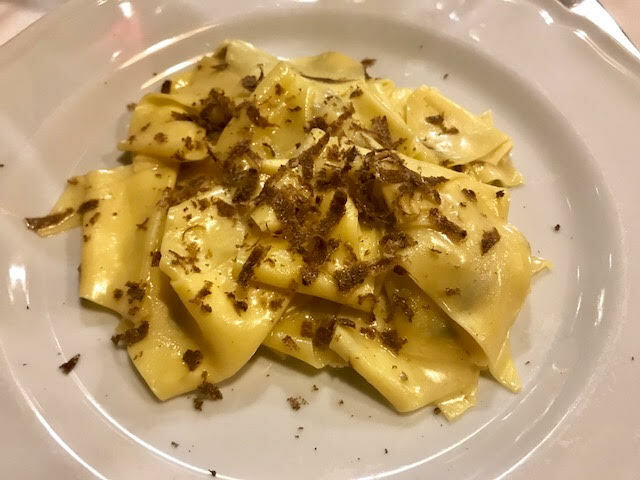 – The truffle in the pasta dish was neither black nor white due to it not being truffle season, but a brown truffle that they can find at the moment. I can still taste it(in the best way possible). 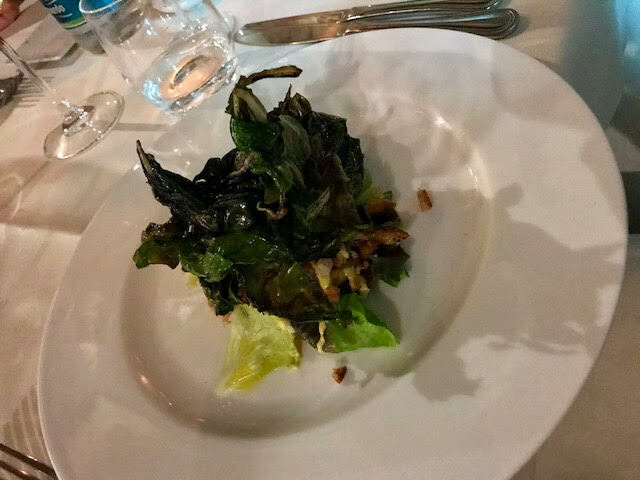 – The ‘Cesar Salad’ crispy leaves were to die for. This idea of having the crunch and the guinea fowl layered under it was spectacular and tasty. 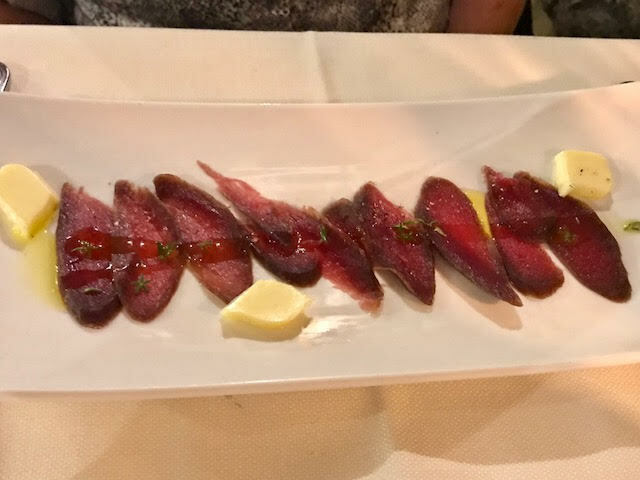 The difference in texture was a treat with every bite. 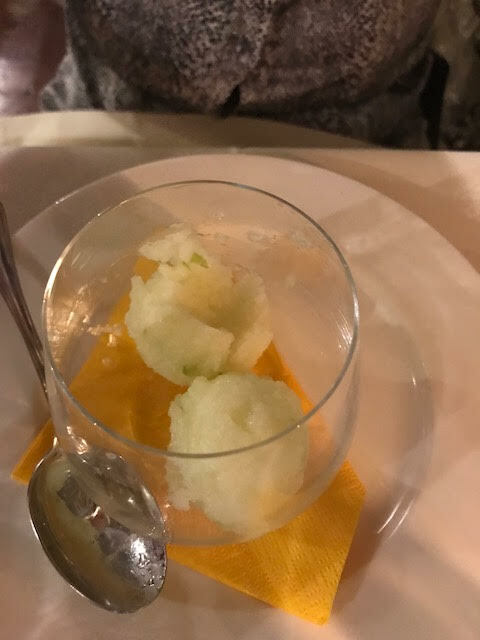 – The gelato was home made and the shredded bits of apple in the apple gelato were very refreshing. – The chocolate pudding had these tiny, crispy bits of chocolate which felt like ‘pop rocks’ when you ate them, but chocolate! I have no idea what or how they were made but it was unlike anything I’ve had in a dessert like that. Please feel free to ask any questions about wine pairing and/or the dishes we ate! COPYRIGHT All critiques, reviews and photography on CaptivEATing.com are written and shot by CaptivEATing.com unless stated otherwise. The property of CaptivEATing.com is not permitted to be used without CaptivEATing.com's permission or without acknowledgment on your own site, blog, or web-presence.